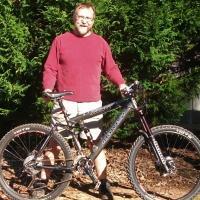 Forums › Mountain Bike Forum › Beginner bike class? The church I attend has classes on Wednesday nights and is offering a beginner mt bike class. Plan on going to it and helping out. The following is the week to week syliibus. The instructor really wants to introduce new riders and others that have not ridden in a long time. What "basic" riding skills should be introduced? I am thinking about going over a log (6" or so) maybe a small stair case. The other thing is I feel something is missin or is being over looked. Any ideas or suggesttions. I have done lots of talks like this at schools – boy scout groups – churches – old folks homes. . . I think you are going to have to gauge it by the group. Typically there are a few in each group that are really ready to try lots of new things. Most (especially this time of year) are more checking things out to see if it will be interesting. Remember to lots of folks "mountain biking" is riding a bike with fatter tires and a flat handlebar, maybe even on a gravel or dirt road. Classes like this are really best if folks bring their bikes and each session has about 15 to 20 min of actual riding, just getting comfortable. If your venue has a spot to ride in you will probably have to split your class into at least 2 groups. With really new riders work on easy things that inspire confidence like tight corners in the parking lot or riding off a curb. Always try to separate spouses or boyfriend/girlfriend or brothers/sisters from each other, you will be amazed at how much more confident they are apart from each other. I would avoid re-enacting ROAM in front of beginners, kids will think its cool but adults will just get scared and think "I’m gonna have to do that?!" One thing missing from the syllabus is having fun. Or "why I ride" type of stuff. Getting out in the woods – in touch with nature – exploring – meet with friends – see places not accessible by foot or car. Notice i did not mention exercise, that is a side effect of all of the above listed things. I always try to get folks to ride because they love it – like I do. Feel free to PM if you have any specific questions. Teach them to stay off the local trails (read: FATS) when wet/closed. That would do wonders for the rest of us who actually work on the trails. What church? Who is the instructor? I’d say SORBA CSRA will be doing another one of these soon, or at least I am hearing noise of it. Make them aware of and perhaps ask them to consider joining SORBA/IMBA to support the local MTB community. SORBA CSRA has done several of these in the past. Perhaps the instructor would like to contact the folks who did those for tips, supplies, materials, cones, etc……a joint effort of sorts. You know who to contact with SORBA CSRA? It’s a great class ! A lot of people attending , bare beginners all the way to expert epic riders . The classes main purpose is to bring people to the Church and increase the numbers of the present Mt Bike group at the Church . The Bike Group rides most Sunday afternoons and when the days are longer they ride Saturdays as well . They ride all the trails in the area , Bartram Trail , Keg Creek , Turkey Creek , FATS , Canal Water Department and Hickory Knob State park to name just a few . Cookouts at the leaders house to follow all rides . And if you have no bike they will supply you one ttil you figure out the size and style that suits you . For info on Church Mt Biking class , Sunday group rides or to schedule a private lesson contact Ride Leader , class instructor Charles Garner (Bikerides4u) or Dave Dillard at Warren Baptist Church Washington Rd Augusta GA 30907 or Bikerides4u@yahoo.com . 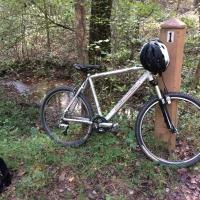 Mt Biking in Augusta GA ROCKS ! Bikes that we all ride are but not limited to are : Giant , Trek , Cannondale , Specialized , Iron Horse , Haro , Norco and Gary Fisher . Epic Mt Biking , Mt Biking Repair , Mt Biking maintenance , Mt Bike Parts , Mt Bike techniques , Mt Bike Fundamentals , Mt Bike Safety and Christain Fellowship , we cover them all ! I think that is an exceptional program your local church is sponsoring. They have something similar here, but not quite the same as yours. I would highly recommend a sponsored program such as yours for newbs and seasoned riders alike. As long as it never becomes a pure bike thing instead of the love/passion for riding & having lots of fun doing that. I never liked those MTB clubs that frown on you if you have a less of a bike than them, or if it is not a high end brand name like Tomac, Santa Cruz, Intense, etc. etc., Ya know what I mean?!? I ride for the love/passion of riding, the goal to better my own self physically and mentally, and of course to have lots of fun. I live the ride and ride to live! I may not be a speed demon XC rider, but I love my casual sprints and of course my freeriding and downhilling adventures are the bomb. Good luck and good riding brother! We share the thinking on this event!